In two experiments, we examine the moderating effect of the legitimacy and the stability of the advantaged in-group status on the relationship between measures of group relative gratification (GRG) and traditional prejudice among members of a structurally advantaged group. In Study 1, 133 participants learned that their advantaged in-group status was based on legitimate or illegitimate grounds. As expected, when participants learned of the legitimate status of their in-group, GRG was associated with the endorsement of traditional prejudice. In Study 2, 188 participants learned that their advantaged in-group status was expected to remain stable or to fluctuate. As predicted, when participants were alerted to the decline in the privileged status of the in-group, GRG was positively associated with traditional prejudice. These findings illuminate the ways in which members of advantaged groups perpetuate intergroup inequities and point to a fuller, more nuanced conceptualization of system stability. This research was supported by a doctoral scholarship from the Social Sciences and Humanities Research Council of Canada conferred to the first author (767-2010-1721) and a grant from the Social Sciences and Humanities Research Council of Canada conferred to the second author (950-203481). The authors thank Tanya Monger for her assistance with data collection. Maritime Provinces Higher Education Commission. (2014). Annual report: Year in review 2013–2014. http://www.mphec.ca/media/83372/2013-2014_AR_EN_FINAL.pdf. Neuwenhuis, B. (2009). 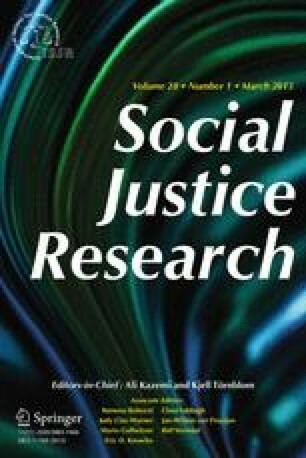 Relative deprivation and relative gratification as predictors of intergroup discrimination: Can prejudice be reduced by equality? Masters thesis. http://ufh.netd.ac.za/bitstream/10353/147/1/Masters%20Thesis%20Brigitte.pdf.